Christmas, Christmas time is here, time for toys and time for…(deep breath) more Chipmunks. 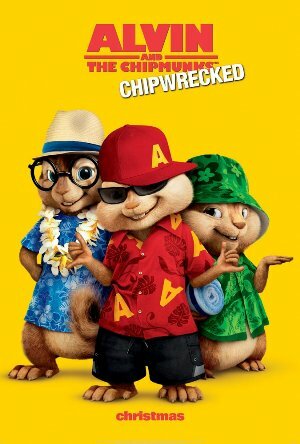 Yes, Alvin and the Chipmunks are back in CHIPWRECKED—second squeakquel…er, sequel to the original 2007 Regency / Fox film blending real people with Ross Bagdasarian, Sr.’s trio of singing Technicolor Tamias straitus. The first big-screen CHIPMUNKS introduced the troublesome triplets and let them wreak holiday havoc in the domicile of adopted manager / songwriter Dave Seville (Jason Lee). The second installment sent the “boys” to school, where they befriend the Chipettes—whom they rescue from greedy music mogul “Uncle Ian” (David Cross) while Dave recuperates from an injury caused by Alvin. Directed by Mike Mitchell (SHREK FOREVER AFTER), the newest tale is the ‘Munks’ best so far—although that’s not saying much. Parents will be glad to know the script dispenses with most of the toilet humor that polluted the previous entries and shifts focus to the complicated relationships between the brown brethren, their female analogues, and beleaguered caretaker / father Dave. Dave takes the vocal vermin on a tropical cruise en route to their appearance at the International Music Awards. The rascally rodents start getting on Captain Corelli’s nerves before the boat even leaves port, starting with a torturous rendition of Go-Go’s hit “Vacation.” So Dave reads the riot act. Shape up or…yeah, you got it. Simon, the uptight intellectual, suggests Alvin’s behavior might improve if Dave would only loosen up a bit. But the squirrely sextet runs amok the instant they’re left alone, with Alvin’s antics getting them swept out to sea with only a chocolate frosted donut so sustain them. In a bizarre turn, disgraced music promoter Ian (in a pelican costume) goes overboard with Dave when the concerned pseudo-dad hang-glides after his missing munchkins. The adversaries must put aside past differences after washing up on the same jungle island as the Chipmunks, who are nowhere to be seen. An amusing role-reversal has Alvin (Justin Long) stepping up to be the resourceful, sympathetic ‘Munk after a spider bite renders Simon (Matthew Gray Gubler) an untamed adrenaline junkie with a French accent and hankering for his female doppelganger, Jeanette (Anna Faris). Meanwhile, treasure-hungry castaway Zoe makes life difficult for everybody—but looks remarkably healthy and well-groomed for someone lost nine years at sea. Apparently under the influence of the same neurotoxin afflicting Simon, she consults a cadre of sports balls with names and painted-on faces (like Tom Hanks’ “Wilson” volleyball from CAST AWAY) and isn’t the least bit interested in the Chipmunks’ plight, even though they’re essentially kids who would benefit from some adult guidance. The Chipmunks are forced to fend for themselves in the wild, with the attention-seeking Alvin gradually earning both his stripes (figuratively speaking) and his pocketknife. The film cursorily indulges requisite lessons about cooperation and unconditional parental love, but there’s room aplenty for gags about You Tube’s “Double Rainbow Guy” and Gollum’s “precious” from THE LORD OF THE RINGS. We’re also treated (or rather subjected) to Chipmunkian versions of bubblegum hits by Lady Gaga, Rihanna, and Katy Perry—none of which rock, but are cause for comedic relief amidst the forest-going frenzy. Plus, I’m still admittedly dazzled by the near-flawless overlap of CGI creatures in a live-action world, and the attention to visual detail (hair and fabric texture, the impact of light and shadow) given the animated characters. CHIPWRECKED’s first act is essentially a commercial for Carnival’s gargantuan, $740 million-dollar cruise ship Dream—which does look like fun (sans talking critters). Nobody’s going to accuse CHIPWRECKED of being original or scientifically accurate. The whole “vacation-gone-awry” schtick has been done to death (even the Brady Bunch wound up spelunking caves on their Hawaiian getaway) and is now premise for parody (TV’s Lost and Survivor). But the target audience, which includes my seven-year old, doesn’t know that. He quite enjoyed the nonsense. Your ‘Munks probably will, too. 2 out of 4 stars.